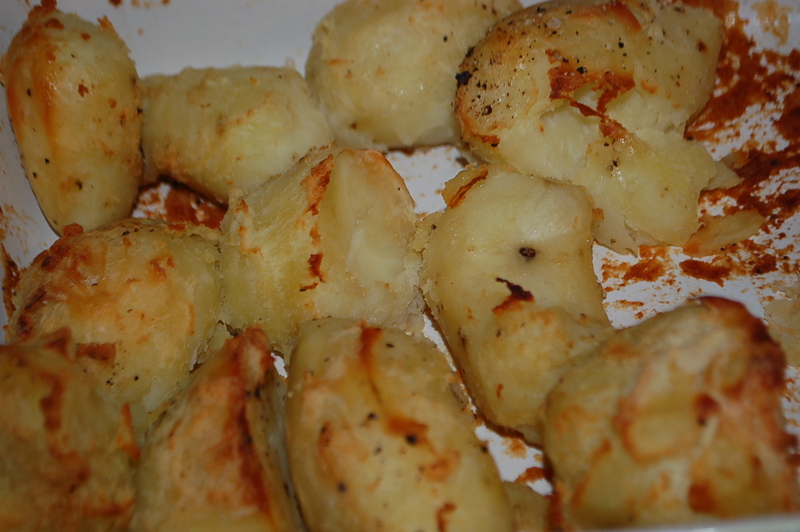 “AN EXEMPLARY VEGETABLE” with a recipe for EXCELLENT BOILED POTATOES | Crappy Kitchen - Good Dinners! ← PENLAND SCHOOL OF CRAFT – NOT REAL LIFE (my small ode to a place I love). I referred to a line from Pride and Prejudice when writing a recipe in a post in 2011 ((click THIS to see recipe), and I cannot tell you how many times the phrase “excellent boiled potatoes” has brought people to my blog! It makes me feel bad when they discover there is in fact no recipe to be found for this much sought after potato dish, and it is high time I put that to rights! 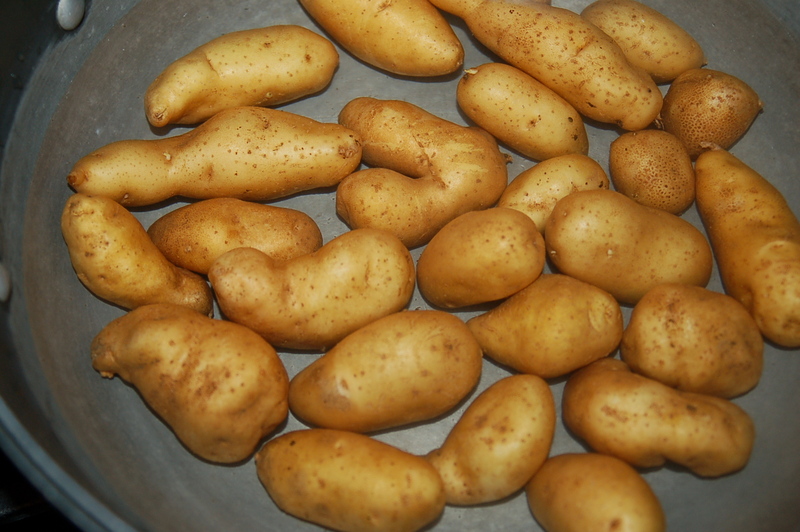 Local Fingerling Potatoes; these potatoes have a wonderful buttery and almost nutty flavor. Johnstown Castle and Gardens in County Wexford, Ireland, built right around the time (early 19th century) Jane Austin wrote marvelous descriptions of her characters traipsing over the English landscape. 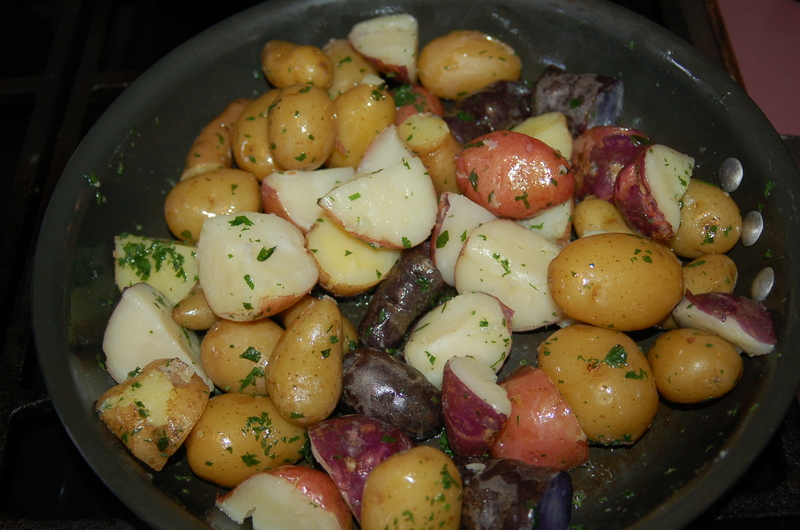 A veritable cornucopia of color: Potatoes tossed with butter, salt and fresh parsley. I don’t really think for a minute that most people would go to such lengths to find this recipe (it is only a bowl of plain potatoes after all), if they were not so fascinated and enthralled by that scene at the dinner table. It captured the atmosphere of a family dinner where one has to put up with unwanted company so perfectly: the quiet clatter of cutlery on plates, the ting of glasses, the sidelong glances of family members to each other, along with some muffled snickering at the poor guests expense. When he inquires about the potatoes you have already been salivating over the meal, and the quick pan of the camera over the potato bowl is a hard thing to forget. Mr Collins (the undesirable guest), also describes the potatoes with words that are usually reserved for a more elegant vegetable such as asparagus or artichokes. Adjectives like “exemplary” and “excellent” only heighten your impulse to jump through the screen and try them for yourself. Boil baby potatoes and slice in half. So, I want to boldly suggest that it was not the potatoes you fell in love with at all: it was Jane Austin herself! But, I will give you the recipe anyway, just so you can complete the movie by actually tasting it too. I am confident that this recipe will satisfy you and will bring to life the potatoes you have been dreaming about since seeing this sweet movie. I did not write to the producers, director or the food stylist to get the recipe either. Being a girl who was born and bred in Ireland, the land where once it was all we had to eat (or all we were left to eat, but that is another very long story), I feel about as sure as a person can be that I don’t need to inquire as to how this bowl of excellent boiled potatoes came to be. The word “boiled” is a dead giveaway and there is only one way to boil a potato. The trick is to find the RIGHT potato for the job and in Ireland we call the potato in question a “floury” potato. A floury potato, when boiled, acquires a sort of outer layer of fluffiness that crumbles when you touch it with your knife or fork. They fall apart easily in the best possible way when very roughly chopped with a knife after they have cooked. All they need is a knob of butter and some salt and voila. They are so delicious you will want to forgo the rest of the meal and just eat the potatoes. I would normally want you to absolutely ignore my suggestions for ingredient brands if you don’t have that particular thing on hand or it is too darn expensive, but here I am afraid, if you want that “exemplary” experience, you will have to follow my suggestions. 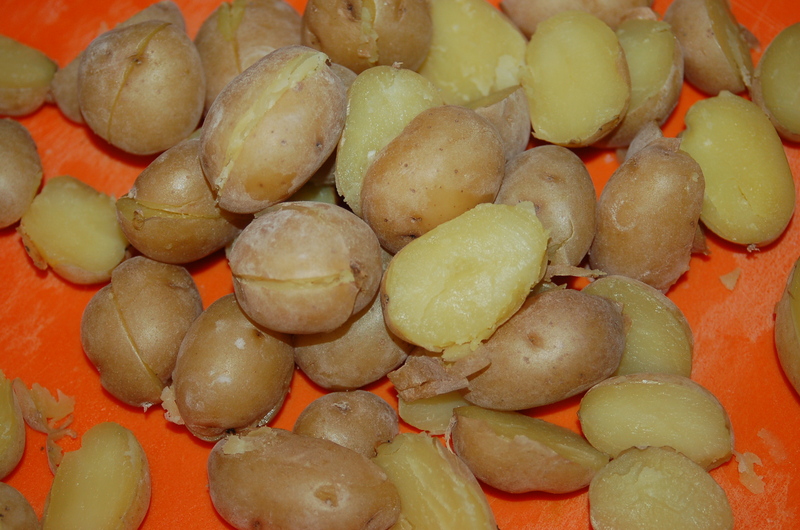 1 – Peel potatoes and, quarter if large and half if on the small side. Rinse with plenty of cold water. 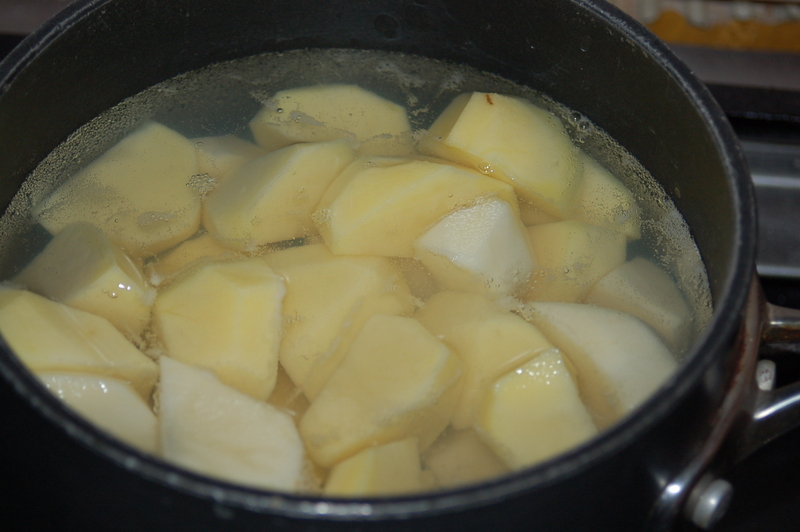 2 – Add to saucepan or pot and cover with cold water (until potatoes a just covered with water). Place on high and bring to a boil. Cover and turn down slightly and boil (the water should still be bubbling, but at a steady rate, nothing so crazy as to make the lid hop around). 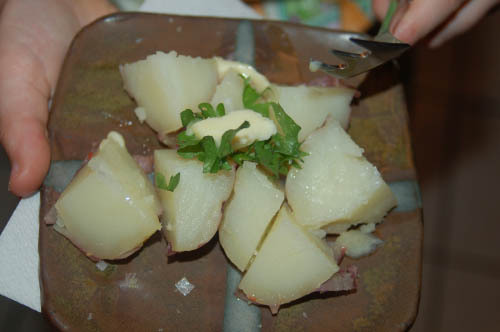 3 – Cook until a knife pierces the potato very easily (but not totally falling apart). Drain off the water and leave the lid off to let them cook for about 2 minutes. 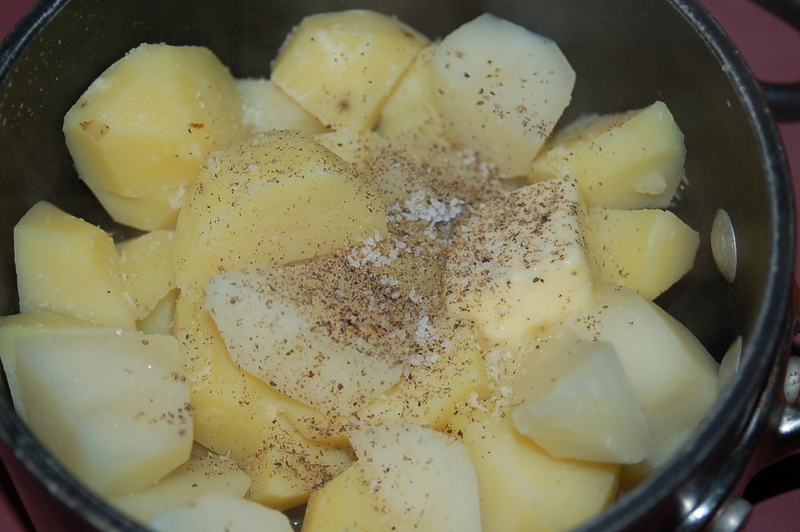 4 – Add the butter and a sprinkle of salt (the amount is up to your taste and what your diet will allow). Replace the lid and using a cloth on each hand, lift the pot and shake it ever so gently. The potatoes with break a little and the butter will melt. Why do I like the films based on Jane Austin’s books so much? (if you want to know, and just so you know). I like listening to the ease and flow of normal conversation. In those days, even the most uneducated had a way with words. It came from practice. It was the only form of communication and of entertainment. So many people did not have access to books or any other forms of amusement. Talking was it, was the center of everything. The story lines do fall short for me sometimes but that doesn’t matter one bit because I am far too enraptured by every delicious word to care. This entry was posted in dinners and tagged boiled potato recipe, excellent boiled potatoes, exemplary vegetable, floury potatoes, jane austin, Johnstown Castle, potato recipe, pride and prejudice, russet potatoes, starchy potatoes, the art of conversation, the best boiling potatoes. Bookmark the permalink. This is the most interesting food blog I ever read. I love the combination of literature and cooking. Do more! We readers love it! Another post on its merry way to you tomorrow! 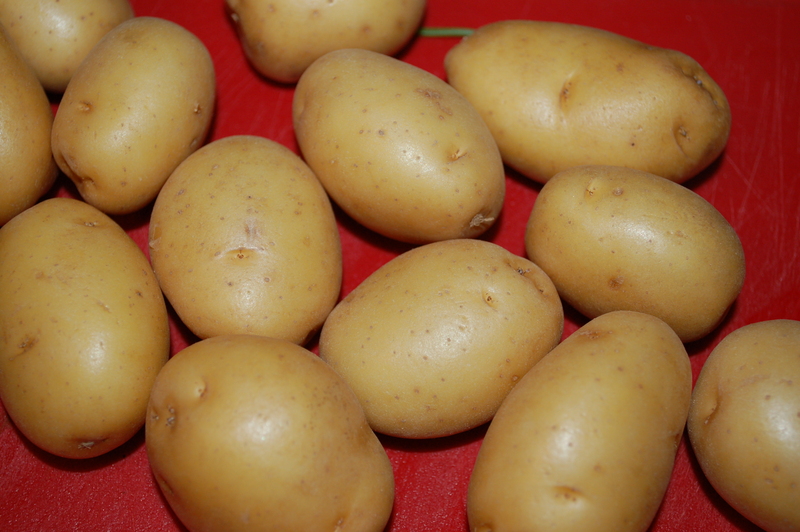 Believe it or not….I found your recipie well looking up ” pride and prejudice boiled potatoes”!!! Jame Austen is one of my favorite authors. That version of pride and prejudice is my absolute favorite! But when they pan over that pot of boiled potatoes…..my mouth waters! Every time! I recently bought potatoes for a recipe and I have half the bag left. That’s when I got the idea that I wanted to make boiled potatoes! And I thought ” someone had to come up with a version!” Thank you so so much!!! I’m so extremely excited for this!!! !